Versa Cage™ » Unitrack Industries, Inc.
Versa Cage™ Card Racks are strong, sturdy, low cost and easy to assemble. Standard sizes conform to electronic industry standards. 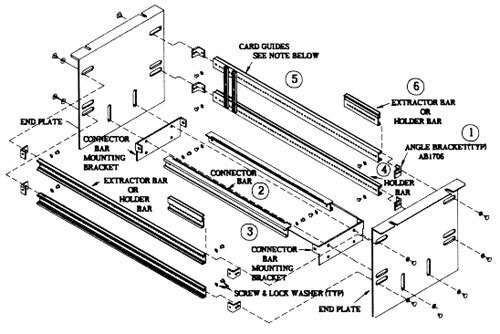 End plates, holder bars and connector bars are accurately punched to close dimensional tolerance. Sturdy extrusions accurately pre-punched on .200 and .250 centers for total versatility in card spacing. 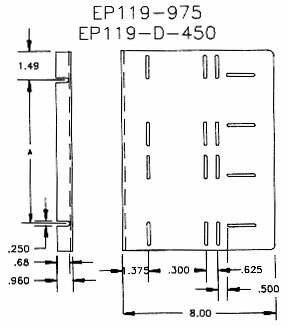 An extrusion pre-punched to perfectly align connectors with p.c. cards in card guides. Connectors can be mounted then pre-wired. Entire assembly can be inserted in cage. Perfectly align and firmly lock bars to end plates. 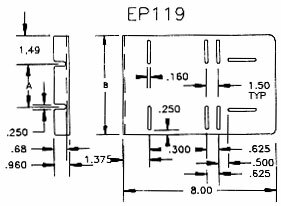 Two 8-32 bolts are provided for assembly with tapped holes in angle brackets. Patented UNITRACK card guides just snap into pre-punched holes in bars. P.C. Cards are gripped between fingers to provide anti-vibration and shock damping. Open designs of UNITRACK card guides allows free flow of air for cooling p.c. cards. When used with KOLOR-KODE CARD EJECTORS, makes insertion or extraction of p.c. cards almost effortless. Catalog numbers listed below do not include card guides. These should be ordered separately. 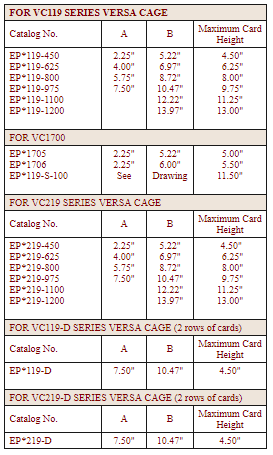 Versa Cage card racks are normally shipped unassembled. Consult factory for prices on assembled cages. If you do not wish to use the full length of the cage, all that is necessary is to cut the six rails to identical lengths. Thus you have a cage that is 19″ long, or any shorter length. NOTE: Add dash number to the Versa Cage catalog number for the features from the table below. Also specify the Connector Bar Mounting Bracket desired. Specify connector mounting hole center dimension when ordering. 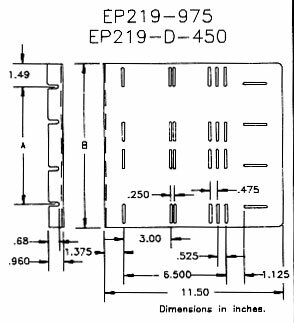 Order part number and dash number suffix. Dash number should be mounting hole centers of connector you wish to use. A Connector with 6.875″ mounting hole centers.